BTS Hits You Right In The Feels With "I Need U"
A.R.M.Y.s have been celebrating the early comeback of BTS, who have been slowly rising up in popularity as they prepare for their upcoming world tour. Fans anticipating with bated breath the MV for BTS’ latest single to drop have not waited in vain as the boys create massive feels with this latest comeback. The title track from their third mini album The Most Beautiful Moment in Life, Pt. 1, “I Need U” stirs the hearts of fans and viewers alike. Known for their catchy hit songs, BTS explores more electro and pop styles with “I Need U” instead of their usual strong hip-hop beats. Surprisingly, the change of style is quite refreshing and manages to have its own unique hook to reel in listeners. This song gives an interesting spin to hip-hop and manages to fuse the wild, free style of hip-hop with lyrical melodies in one song. The lyrics themselves are nothing special and tell of a lonely person struggling to come to terms with their breakup. I was a bit let down and expected more, especially for the rap section since Rap Monster has quite the reputation as a rapper. Overall, the boys manage to pull off the catchy melodies with the occasional falsetto, but the vocalists and the rappers could definitely have shown off their vocal range and capabilities a little more. Dark and muted, the MV takes on a more narrative flow whilst taking the focus off choreography, and the only person seen vocalizing is Rap Monster during his rap solo. BTS reveal a more moody and emotional side as they wander around aimlessly and bask in their emotions. Despite most of them not vocalizing throughout the MV, each member shows off his acting abilities because they are as captivating as they are when executing any dance. Alternating between indoor and outdoor scenes, the sets were minimalistic to emphasize the focus on the boys. The MV intersperses individual scenes with group scenes of all of BTS. The boys are dressed in mainly black with red accents, giving off a rather moody atmosphere. Delving more into the interactions of BTS as a group, the boys seem to be much happier when they are together than when they were alone. Maybe it suggests that friends are important to help you get over that significant other. I rather enjoyed seeing them fool around, hang out together in a group and break into smiles with each other. Each of the members seems to represent a different way of coping regarding heartbreak. Several scenes were really poignant — when Suga considers setting fire to the room and J-hope burning his pills (that he probably was taking to help cure depression). Jungkook wanders around aimlessly, lost and without direction in life, while Jimin tries to drown himself to get rid of the pain. Little subtle messages of the boys trying to cope with the loss of a girl resonate with their helplessness and explore a bit into how different people deal with heartbreak. These little struggles reveal more into the pain of getting over someone, and the MV ends off with them sleeping serenely, hopefully at peace with themselves at last. With three members, Rap Monster, Suga and J-Hope, playing a part in writing this song, “I Need U” tells the story of a desperate heart trying to hold onto a fleeting love. A seemingly shallow song title turns emotions upside down and clearly reveals another side of love with the help of the MV. 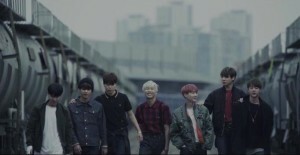 This bittersweet and nostalgic MV manages to hit the right notes, and viewers feel their despair and their heartbreak through the screen, displaying BTS’ acting skills. While I do miss their on point choreography, this MV more or less makes up for it by revealing a more mature side to the boys. Word is that there will be another MV that is rated 19+ to be released, and there are hopes that it will be more emotionally and visually jarring from what the teaser has shown us. It’s nice to see BTS growing and experimenting with different genres and sounds. Their potential for versatility is there, and there is so much to explore in terms of hip-hop and music. Seeing the boys trying out different concepts and directions for their songs keeps viewers hooked as it spices things up. This track makes me anticipate what the boys will show us next. With the boys having an active hand in writing the songs in their newest album, hopefully the rest of In the Mood for Love will let us experience a more personal side of our idols. anything and everything about pop culture, skateboarding and music. Roundtable: Cast Your Own Variety Show!